"Who Are the Real Racists and Fascists in America?" DEATH OF A NATION, conservative pundit Dinesh D’Souza’s latest documentary, uses re-enactments about major 20th Century events, interviews with history scholars and commentary to show that the leftist policies of the current Democratic Party and the so-called progressive movement are racist and fascist. Jampacked with information, DEATH OF A NATION is a little long and some of the re-enactments seem unnecessary to D’Souza’s main arguments, but it’s a powerful, factually credible indictment of the Left in America, including the fanatic, frenzied leftist critics of Pres. Donald Trump. The movie opens with the suicide and immediate aftermath of Adolf Hitler and his mistress, Eva Braun’s, deaths at the end of World War II, as the Allies bomb Berlin. Narrator Dinesh D’Souza, the movie’s co-writer and co-director, notes that a nation can be destroyed by being conquered from outside or by decaying from within. He then shows the reactions of the “news” media, Democrats, and leftists to the candidacy and election of New York real estate mogul Donald Trump as the 45th American president. As Trump becomes more and more successful, the reactions become more frenzied and more fanatic, going from laughter to virtually frothing at the mouth. Eventually, the leftist “news” reporters, anchors, pundits, and political figures, including some well-known Democrats, call Trump and his supporters racist and fascist. But, who are the real racists and fascists? asks D’Souza. D’Souza then relates the history of the fascist movements created by the Marxist Benito Mussolini in Italy after World War I and by Hitler and his minions in Germany in the 1920s and 1930s. Multiple re-enactments are screened, interspersed with commentary and interviews with several leading history scholars. D’Souza shows how Mussolini and Hitler borrowed from Democratic Party methods in the 19th and 20th Century, such as Democratic Party laws of forced segregation and mistreatment of Native Americans, and from the American eugenics movement led by such figures as Margaret Sanger, the “progressive” founder of Planned Parenthood. Hitler actually wrote a couple personal letters to Planned Parenthood officials praising their work. D’Souza also shows how leading Democrats such as FDR expressed admiration for how Mussolini ran Italy and how Hitler ran Germany so efficiently in the early 1930s. Finally, D’Souza shows how Hitler’s people tried to solve the so-called “Jewish Problem” by using Democrat laws in the South geared to oppressing black people. Democrat lawmakers used the “one drop rule” to determine what people should be legally labeled black, but Hitler’s people (amazingly) found that rule too harsh and invented a three-grandparent rule for deciding which people should be legally declared fully “Jewish.” People with two Jewish grandparents were considered partly Jewish. By making these comparisons with the Democratic Party and defining fascism, D’Souza proves that today’s Democratic Party leaders have similar policies to the fascists running Italy and Germany in the first half of the 20th Century. He also shows that the party’s treatment of blacks and Hispanics in the urban ghettos and barrios of America is similar to Hitler’s racist practice of putting Jews and other “unacceptable” people into labor camps. These ghettos and barriers are similar to the slave plantations that Democrat slaveowners ran before the Civil War. Finally, D’Souza shows that Pres. Trump’s economic, social policies are the exact opposite of the fascist, racist policies of today’s Democratic Party. He even interviews white supremacist leader Richard Spencer to show that Spencer’s collectivist, secular, big government ideology is much closer to the Democratic Party’s neo-fascist, racist and statist “progressive” policies than they are to Trump’s pro-capitalist and anti-socialist policies favoring economic, political, and religious freedom. What are we to do about stopping the fascist, racist agenda of today’s Democratic Party? D’Souza asks viewers. He not only offers Donald Trump and his supporters as an example. He also points to the non-violent rebellion of Sophie Scholl, a leader of Germany’s Resistance movement, against Hitler’s fascist regime. Scenes patterned after the 2005 Award-winning German movie, SOPHIE SCHOLL – THE FINAL DAYS, are inserted, showing Sophie’s brave resistance and sacrifice. DEATH OF A NATION could be tightened up a bit. It runs a bit long and is jampacked with almost too much factual information. Also, some of the re-enactments seem unnecessary to Dinesh D’Souza’s main arguments, especially scenes of Hitler and Eva Braun getting ready to commit suicide and re-enactments of Hitler leading the famous “Beer Hall” revolution that led to his imprisonment in 1924. That said, the movie is a powerful, factually credible indictment of the Left in America, including the Democratic Party, the mainstream media and their fanatic, frenzied leftist critics of Pres. Donald Trump. D’Souza correctly and effectively labels their program for America as enslavement and tyranny. DEATH OF A NATION has some depicted and implied violence. For example, some Nazi thugs are shown beating up a couple people. Eva Braun, Hitler’s mistress, is shown taking poison and modern-day leftists in America are shown setting fires and vandalizing buildings in newsreel footage. Also, a gunshot is heard off screen after Hitler puts a gun to his head. The documentary also contains one light obscenity and some bleeped out obscenities from several Cable News programs that played the night that Donald Trump won the presidency. Finally, one of Hitler’s associates is shown being arrested by Hitler’s secret police while the man and two of his young male lovers are arrested. So, MOVIEGUIDE® advises caution for older children for DEATH OF A NATION, but the movie is a must-see documentary for mature viewers. Some vandalism by leftist protestors and examples of racism shown but rebuked. 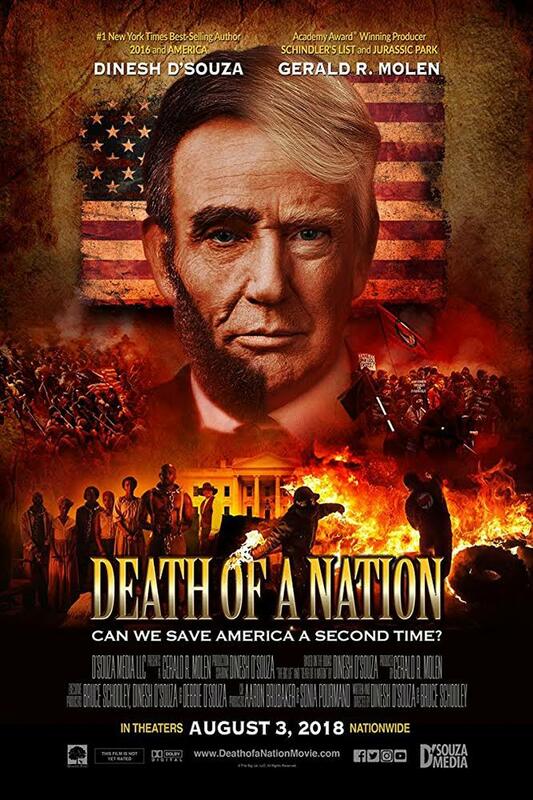 DEATH OF A NATION is conservative pundit Dinesh D’Souza’s latest feature documentary. It uses re-enactments about major 20th Century events, interviews with historians and commentary to show that the policies of the current Democratic Party and the so-called progressive movement are racist and fascist. D’Souza discusses Abraham Lincoln’s defense of liberty against the Democratic Party’s promotion of slavery. He then uses historical re-enactments to show how the fascism and racism in Dictator Benito Mussolini’s Italy and Hitler’s National Socialist Germany share many things in common with the Democratic Party of the past and present. Finally, he shows how the free-market principles of Pres. Donald Trump are the opposite of the collectivist fascism and racism promoted by Democrats and leftists. DEATH OF A NATION could be edited more concisely, with a view toward building a stronger climax. Also, some re-enactments seem unnecessary to the arguments. That said, DEATH OF A NATION is a factually credible indictment of the Left in America, including the Democratic Party and its mouthpiece, the mainstream media. Caution is advised for older children because of depicted and implied violence.